22nd street Jungle Stairs is on a mission to rehab and beautify the steps on 22nd Street between Diamond & Castro. 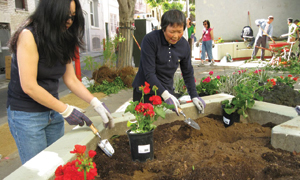 We are a community led urban improvement landscaping initiative. We see the potential to transform the land around Noe Valley’s 22nd street stairs into an tropical urban oasis. We are a collective of neighbors who love landscape design and gardening and have a vision to turn this neglected section of public land into a beautiful local San Francisco destination. Most importantly we want to extend the “jungle aesthetic” and improve the safety of the stairs. This neglected tract of land is a hidden micro climate that harbors a densely tropical oasis in the middle of the city. With a little love and care we can tame this overgrown beast into an amazing tropical conservatory. - Funding Procurement Manager: further our stalled progress of appling for a city grant to fund this initiative. Funding would be primarily allocated towards repairing the handrails, terracing the hillside and purchasing plants. Besides horticultural education and beautification we hope this effort continues to strengthen our already tight knit community on 22nd Street. Visit Jungle Stairs at our Blog, Facebook page, or Twitter feed.